We have bleached it again since then, and the streakys are wayyyyy lighter now. 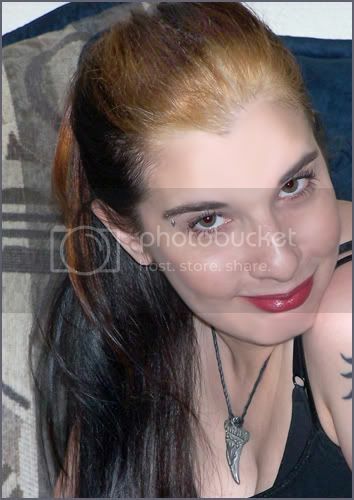 This was after Round One and they were still a weird mix of reddish-blondish-yellowish-brown at that stage. But... bleaching out jet-black hair is a beeeotch you guys! I had no idea. Because bleaching is a torturous process on the hair we still have at least one, maaaaybe two more bleach sessions to go to get it to that white-blond color that I desire. We've been giving the hair a few weeks in between bleaching to recover, so it doesn't get fried, so it's a slow process. But right now my streaks are tons lighter than what you see in these pics, in fact from the roots to about a third of the way down I already have that pale blonde tone I wanted, woot. It looks cute! I would love white streaks in my hair like my icon. 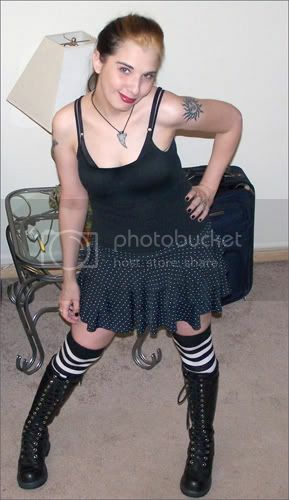 I had a blonde streak back in college. I think I posted a pic of it a while ago. I just had my hair dyed to somewhat of what my natural hair color is( reddish medium blonde). I have to wait a bit for highlights but I'm getting blonde ones. Reddish blonde hair is sooo lovely, I'd love to see how it look with the streaks! Thanks for the compliment, muahh! Is the first on photoshopped? Or are your eyes really that cool colour green? Me likes! I wanna see your hair down though! Or in a pomp. Hah that would look cute. ...well, minus the smoldering-Rogue-hotness and the leather bodysuit, heheheh. Funny you should mention the she-pomp, I had my hair trimmed recently and my lady cut the front at shorter angles, so I have this front part that I can totally pin back & up now, makes a cute little mini-pomp!! I have been wearing it like that for about a month heheh. Yes, I will try to get pics ;) Thanks again!!! Hahahaaa, haha.... I'm such a dork. But what's new?? Heee. And now, coming soon to a lost destination near you . . .
Now with 20% more fun!!! If I ever get my dumb car fixed, I'll drive down there and we'll have girl's weekend...maybe go to Juarez and charm 'em into free jewelry...whatta ya say?